Mosab Yousef, ISA agent and son of Hamas leader in PA, urges Israel to stop 'fatally flawed' ceasefire and attack before Hamas rebuilds. The growing chorus of calls for Israel to crush Hamas in Gaza before they begin another war has gained a new voice Tuesday - this time, from the son of a major Hamas leader. 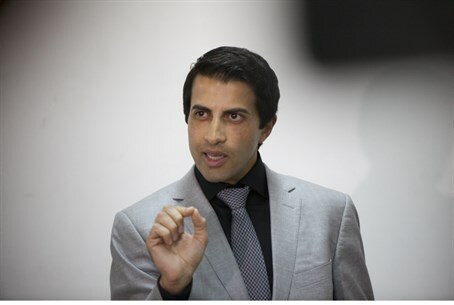 Mosab Yousef, the son of Hamas leader in the Palestinian Authority (PA) Sheikh Hassan Yousef known for working for the Israel Security Agency (ISA or Shin Bet) from 1997 to 2007, urged Israel Tuesday to go to war with Hamas - in order to make peace with the Palestinians. Yousef stated in a special interview with Walla! News that he is well aware of the significance of his call - and that, far beyond "warmongering," he urges Israel to war really due to practical and security considerations. "I know it sounds dangerous, like warmongering," Yousef said. "But it does not stem from that motive at all." "I say these things because you cannot escape from reality," he continued. "You cannot escape from [Hamas militarization] with temporary solutions. You have to address the Hamas problem by pulling it up from the roots, once and for all." Yousef added that now is the "perfect time" for Israel to re-engage with Gaza, before it expands on its reconstruction efforts. Indeed, analysts have already raised concerns and provided evidence that Hamas has begun to reconstruct terror tunnels into Israel - and began to do so mere weeks after Operation Protective Edge this summer ground to a halt. "As long as Israel waits for the enemy to become more dangerous, future wars with [Hamas] grow more and more difficult," he added. "Hit them in the winter, when they are unprepared." Yousef also told the daily that, in his view, another war could solve the tense security situation in Judea-Samaria and in Jerusalem, where the PA is stirring up tensions to "show Israel's weakness." He urged Israel to be strong and show deterrence, but also to be wary of harming civilians. Yousef also slammed the cease-fire deal with Hamas, saying that the concept in general is "fundamentally flawed." The stagnation, he says, merely gives Hamas more time to rebuild - both militarily and politically. Moreover, he maintains that the view of Hamas as a normal political body is a dangerous misunderstanding of the situation. "This is, first and foremost, and ideological movement," he stated. "Thus, there is no concept of negotiations or compromise with it." Yousef's remarks follow not only reports that Hamas is rapidly rebuilding its terror network, but amidst several signs that it is expanding its activities far beyond Gaza. Last week, the ISA busted a large terror cell in Judea and Samaria - Hamas terrorists who had been conscripted via Hamas agents in Turkey to commit terror attacks in the region as well as in Jerusalem. Less than twelve hours earlier, Hamas leader Mahmoud Al-Zahar publicly declared that the group was intending to widen its terror scope throughout Jerusalem, Judea and Samaria, and that it intends to continue to lead the Palestinian Arab camp which advocates for armed struggle until Israel is destroyed. Hamas has also been escalating its incitement campaign against Jews and Israelis through heightened rhetoric and social media, releasing a music video in broken Hebrew this month encouraging "car attacks" against Israeli citizens.